Professor Oscar Stafsudd of the Electrical & Computer Engineering Department has been awarded the Lifetime Achievement Award by the Henry Samueli School of Engineeting & Applied Science. Oscar Stafsudd and UCLA have been closely intertwined for more than 60 years. Oscar received all three degrees at UCLA (BSEE, 1959; MSEE 1961; PhD Spectroscopy, 1967). At the time, an Engineering curriculum involved a substantial amount of physics. All who know Oscar admire his broad knowledge of physics and materials and go to him for definitive answers on thorny problems. 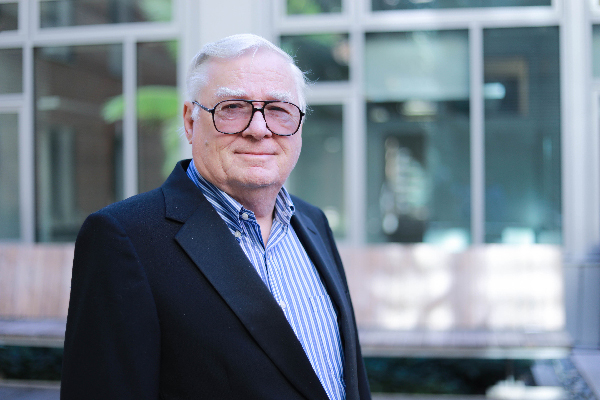 He joined the UCLA faculty in 1967 and retired in 2018. For many years, Oscar held a consulting position at Hughes Research Laboratories, where the first working laser was demonstrated in 1960. At UCLA he introduced one of the first hands-on undergraduate courses in optics, involving lasers, LEDs, the use of optical components, and optical materials. He has taught this course for almost 40 years, and when he was unable to teach it, one of his PhDs would do so. The undergraduate “laser lab”, a signature offering of the EE Department, proved to be a turning point in the careers of many students. Oscar is one of the early researchers from UCLA Engineering to apply lasers to medical problems. His collaboration on this work with the late Warren Grundfest spans more than 20 years. Oscar served as Vice Chair for Undergraduate Affairs for more than ten years. It is a job that requires great patience with students, a comprehensive knowledge of university rules, and the skills to navigate through innumerable specific problems and crises that students face. In 2014, as part of their estate Oscar and Jacquie Stafsudd gifted $1 million to UCLA Engineering. The endowment is directed to the ECE Department, preferably to enable undergraduate research.